Skull Island: Reign of Kong, sandwiched in between Jurassic Park and Toon Lagoon. 36 inches; child swap available; single riders line available; express accepted. King Kong is back and better than ever in this new blockbuster attraction opening at Universal’s Islands of Adventure. Guests board large expedition vehicles and are led by one of five unique drivers on this attraction that merges both physical and digital effects into one immersive attraction. 5 out of 5. While this attraction never leaves the ground, the journey through Skull Island is intense. Additionally, the queue for this attraction is home to natives who often startle guests. While this attraction’s height restriction makes it suitable for almost anyone, the visuals and environment may scare younger children. 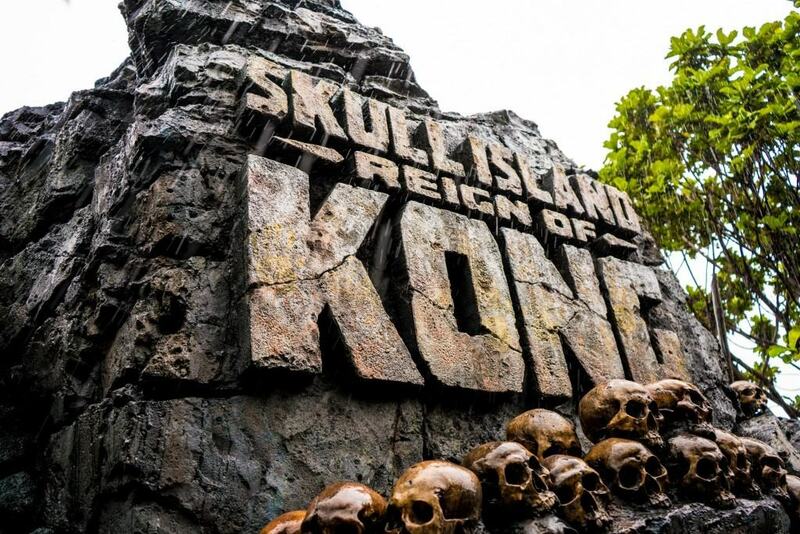 This is the second Kong attraction to open at Universal Orlando. The first, KONGfrontation, was an original Universal Studios Florida attraction and closed in 2002. We got lucky and got to the park right at opening and there was essentially zero wait for Kong. It was fine, it’s a good ride and has some fear factor. The effects are impressive but I’d never wait in line for it. If I’d waited more than 30 minutes I would have been pissed.If you’ve tried the Fast and the furious at Univeral Studios, it’s very similar. There are so many incredible simulator rides out there right now, in my opinion - this one is just okay. First time at Universal, haven't heard any hype about this ride, so I had no expectations (besides hoping to enjoy myself.) The lineup atmosphere was good, with the props, the boogie men scaring children, and with the gibbering old crone in the skull room.You know right away once you get handed 3D glasses and see there are no restraints that you are in for a snore-fest. In between huge projector screens, a bus gets shaken back and forth, squirted with water, accelerated a bit, then slowly driven past an animatronic growling Kong head.A GOOD ride would have full restraints, Kong lifting the bus off the ground, tilting it vertical, carrying it up a cliff wall, smashing the roof a couple times, then throwing it away; this was no good. Too much reliance on 3D for the ride; 3D effects should add to an experience, not be a substitute for an experience. Universal annual passholder for 20 years. Worst ride ever. I had to come and write a review for this ride. The queue is awesome, don't get me wrong.. It's what gives my review 1 star. However, the ride itself is severely underwhelming. Kongfrontation (the original ride) was miles ahead of this ride. What was bad? Well, first of all, enough of the 3D rides. But this one is a giant bus with no seatbelts or lapbars (gives an idea on how tame it is).. The vehicle will shake slightly but there's nothing but 3 screens and a very underwhelming Kong. The animatronic is great but it's nothing like the original.. That was a Kong HANGING.. This one is just sitting there with his head visible. Overall, I wouldn't wait more than 5 minutes for this ride. Very sad to see this is what Universal hyped up because I was quite excited for it. Seriously, ENOUGH OF THE 3D rides! Unlike some people, I enjoyed this ride. Some complained about the use of screens but I think its good considering A) Tight space its in and B) Use of practical effects isn't possible for this ride.The screen use is pretty good (quality is better than I have ever seen) and the AA at the end is amazing.